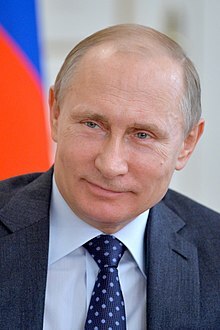 Vladimir Vladimirovich Putin ">[vlɐˈdʲimʲɪr vlɐˈdʲimʲɪrəvʲɪtɕ ˈputʲɪn]; born 7 October 1952) is a Russian politician who is the current President of the Russian Federation, holding the office since 7 May 2012. He was Prime Minister from 1999 to 2000, President from 2000 to 2008, and again Prime Minister from 2008 to 2012. During his second term as Prime Minister, he was the Chairman of the United Russia Party, the ruling party. Vladimir Vladimirovich Putin (/ˈpuːtɪn/; Russian: Влади́мир Влади́мирович Пу́тин; [vlɐˈdʲimʲɪr vlɐˈdʲimʲɪrəvʲɪtɕ ˈputʲɪn]; born 7 October 1952) is a Russian politician who is the current President of the Russian Federation, holding the office since 7 May 2012. He was Prime Minister from 1999 to 2000, President from 2000 to 2008, and again Prime Minister from 2008 to 2012. During his second term as Prime Minister, he was the Chairman of the United Russia Party, the ruling party. Born in Saint Petersburg, Putin studied German at Saint Petersburg High School 281, and speaks fluent German. He then studied law at the Saint Petersburg State University, graduating in 1975. Putin was a KGB foreign intelligence officer for 16 years, rising to the rank of Lieutenant Colonel before retiring in 1991 to enter politics in Saint Petersburg. He moved to Moscow in 1996 and joined President Boris Yeltsin's administration, rising quickly through the ranks and becoming Acting President on 31 December 1999, when Yeltsin resigned. Putin won the subsequent 2000 presidential election by a 53% to 30% margin, thus avoiding a runoff with his Communist Party opponent, Gennady Zyuganov. He was reelected President in 2004 with 72% of the vote. During Putin's first presidency, the Russian economy grew for eight straight years, and GDP measured in purchasing power increased by 72%. The growth was a result of the 2000s commodities boom, high oil prices, and prudent economic and fiscal policies. Because of constitutionally mandated term limits, Putin was ineligible to run for a third consecutive presidential term in 2008. The 2008 presidential election was won by Dmitry Medvedev, who appointed Putin Prime Minister, beginning a period of so-called "tandemocracy". In September 2011, after presidential terms were extended from four to six years, Putin announced he would seek a third term as president. He won the March 2012 presidential election with 64% of the vote, a result which aligned with pre-election polling. Falling oil prices coupled with international sanctions imposed at the beginning of 2014 after Russia's annexation of Crimea and military intervention in Eastern Ukraine led to GDP shrinking by 3.7% in 2015. Under Putin's leadership, Russia has scored poorly on both the Democracy index and the Corruption index. Putin has enjoyed very high domestic approval ratings during his career, and received extensive international attention as one of the world's most powerful leaders. In 2007, he was the Time Person of the Year. In 2015, he was #1 on the Time's Most Influential People List. Forbes ranked him the world's most powerful individual four times in a row from 2013 to 2016.